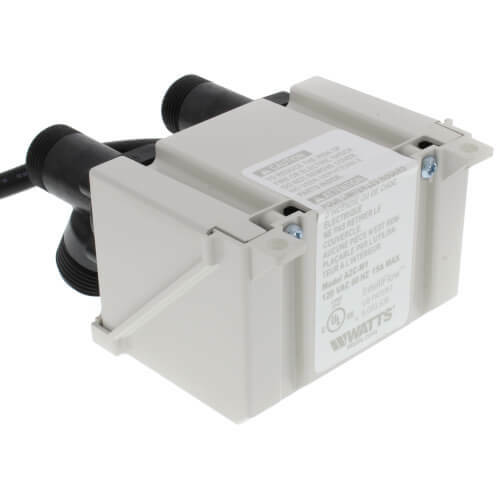 Series A2C IntelliFlow Automatic Washing Machine Water Shutoff Valves with Leak Sensor are used in residential applications to protect against catastrophic water damage from a burst inlet hose connected to a washing machine in use or unattended. The Series A2C IntelliFlow senses when the washing machine is on or off, and then opens or closes the hot and cold inlet valves as needed to allow or prevent water from flowing to the washer. If the Series A2C detects a leak, current flow to both the hot and cold water valves are immediately interrupted and closed. It consists of an electrical three-prong outlet to receive a washing machine power cable, leak sensor, a power cord, and a replaceable internal strainer screen. The new Intelliflow Models A2C-M1 and A2C-WB-M1 also include a leak sensor. The water sensor is placed on the floor behind the washing machine. Upon detection of water at the sensor, the IntelliFlow automatically shuts off the water supply to the washing machine. This provides an additional level of security, should a hose burst while the washing machine is in operation.